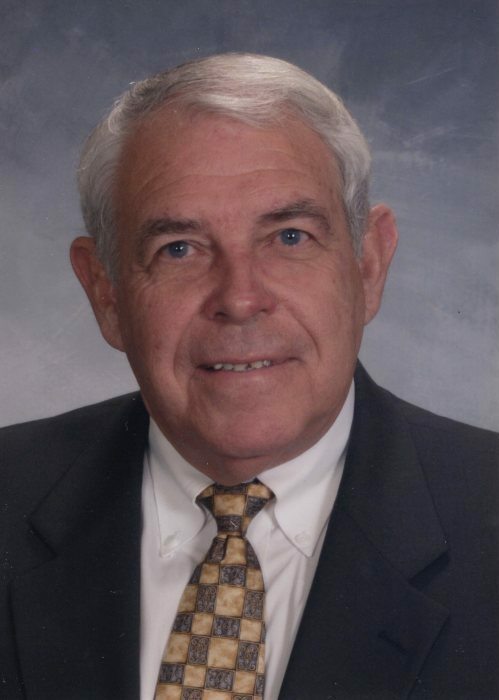 Joe Pat Tolson, 77, passed away Sunday, February 3rd, 2019, after a battle with Interstitial Lung Disease. A celebration of life will be held Thursday, February 7th, at 11:00am at the Pinetops United Methodist Church with the Reverend Jesse Baker officiating. Burial will follow in Pineview Cemetery, Pinetops, N.C.
Joe was a graduate of Atlantic Christian College (Barton) and received his Masters of Education from the University of Virginia. He retired from Edgecombe Community College as Assistant Vice-President after 28 years of service. He served in the North Carolina General Assembly for 18 years, serving districts 71 and 23. He was a proud native of Edgecombe County and served his community as a member of various clubs and boards with a passion for education and technology. Joe’s greatest love was his family. He was affectionately known as Papa to his grandchildren; Cole, Ethan, and Anna. He loved cooking for all! Whether stirring the stew pot, manning a grill full of chicken or pig, or baking cakes to share, he was happiest cooking for those he loved. Joe was preceded in death by his parents, Thomas Lester and Effie Proctor Tolson; sisters, Nora Flanagan and Eva Sugg; brothers, Billy Tolson, Lester T. Tolson, Jr., and Fred Tolson. He is survived by his loving family, including his wife of 26 years, Janice Brafford Tolson of Pinetops. His children and their mother, Anne Tolson of Tarboro; Andi Tolson Green and her husband, Michael (Hop) and their daughter, Anna of Tarboro; Ken Tolson and his wife, Lori and their son, Cole of Raleigh/Atlanta; Mike Tolson and his wife, Mandy and their son, Ethan of Crisp; Brothers, Norris Tolson and his wife, Betsy of Pinetops; Mickey Tolson and his wife, Dottie of Tarboro and many nieces, nephews and special friends. The family will receive friends and family, Wednesday, February 6th, at Carlisle Funeral Home from 6:00 – 8:00pm and other times at the home, 105 Edgewood Dr., Pinetops, NC, or at the home of Norris and Betsy Tolson, Vinedale, Hwy. 43, Pinetops, NC. Flowers are welcome, or donations can be made in his memory to the Respiratory Therapy Program at Edgecombe Community College. Checks can be made payable to the Edgecombe Community College Foundation, 2009 W. Wilson Street, Tarboro, NC 27886.